I strongly encourage active surfers everywhere to spend the extra time and effort to get a board designed and built around their current surfing needs. It does not increase the cost of the new board whatsoever, but it does increase the chances of getting a magic new board immensely. It really helps the progression of design refinement to build a new board design from the results of your overall experience riding your previous board. 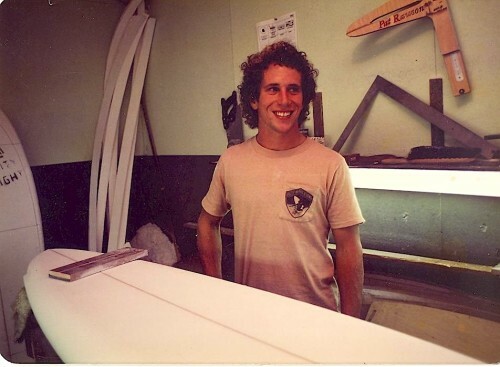 As a shaper: I spend much energy saving every board design file I shape and design worldwide in my master design archives, as to help my returning customers constantly fine tune their equipment they ride, and increase their satisfaction and performance out in the water. Please completely fill out my web-based form so I can get all relevant information regarding your order, and make sure and include your age, weight, and overall surfing experience. Alternatively, print out the Rawson Order Form PDF for submitting artwork and scan and email or fax to 888-234-4394. If you’ll fill out the web-based form completely, I can provide accurate turn around time, pricing, as well as answer any questions you may have regarding your new board via email or telephone. Shaping custom orders is the most satisfying and strongest segment of my business world-wide.